2565 - New Mexico & US flags crossed uniform or souvenir embroidered patch. 3.125" tall X 3.5" wide. Patches sew or iron-on & are carded for rack display for stores. 2557 - NEW MEXICO - LAND OF ENCHANTMENT souvenir embroidered patch. 2.5" - Patches sew or iron-on & are carded for a display rack for stores. 2556 - NEW MEXICO colorful zia shield souvenir embroidered patch - 2 13/16" tall x 2.125" wide - Patches sew or iron-on & are carded to hang on a display rack for stores. 2554 - New Mexico flag uniform or souvenir embroidered patch. 2" tall x 3.25" wide - Patches sew or iron-on & are carded for a display rack for a store. Patches sew or iron-on & are carded for a display rack for stores. 2555 - NEW MEXICO medium flag shield embroidered patch. 2.5" wide x 2.75" tall - g. Patches sew or iron-on & are carded for a display rack for stores. 2551 - NEW MEXICO small flag shield embroidered patch. 1.75" wide X 2.5" tall - Patches sew or iron-on & are carded for a display rack for stores. 2570 - NEW MEXICO state shape & zia embroidered patch. 100% embroidered. 2.375" tall x 2 3/16" wide - Patches sew or iron-on and are carded for a display rack for stores. 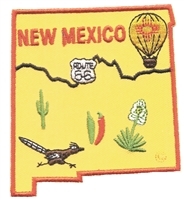 2576 - NEW MEXICO wavy flag ribbon souvenir embroidered patch. 1.5" tall x 4.75" wide. Patches sew or iron-on & are carded for retail display for stores. 2586 - New Mexico wavy flag souvenir embroidered patch. 100% embroidered & measures 1.75" wide x 1.875" tall. Patches sew or iron-on & are carded for a display rack for stores. 2553 - NEW MEXICO zia shield souvenir embroidered patch. 2.875" tall x 2.875" wide. Patches sew or iron-on & are carded for a display rack for stores.